You'll be £25.00 closer to your next £10.00 credit when you purchase Theaters of the American Revolution. What's this? Identifying discrete geographical areas in order to better understand a conflict that moves across hundreds of thou- sands of square miles of land and water, such as the American Civil War and World War II, has been a valuable historical method. During this time of greater study of the war that made America, the authors of Theaters of the American Revolution take this approach for the first time. The result is a stimulating volume that will allow readers to see how the war flowed from region to region from 1775 to 1781, beginning in the Northern colonies and Canada, through the dark months in the Middle colonies, to a shift to the South and culmination at Yorktown. Simultaneously, the war raged up and down the western frontier, with the Patriots working to keep the British and their Indian allies from disrupting the main battle armies to the east. Equally important was the war at sea, where American privateers and a fledgling navy attempted to harass the British; but with the entrance of France to the conflict, the control of the sea took a much more balanced—and important— aspect. 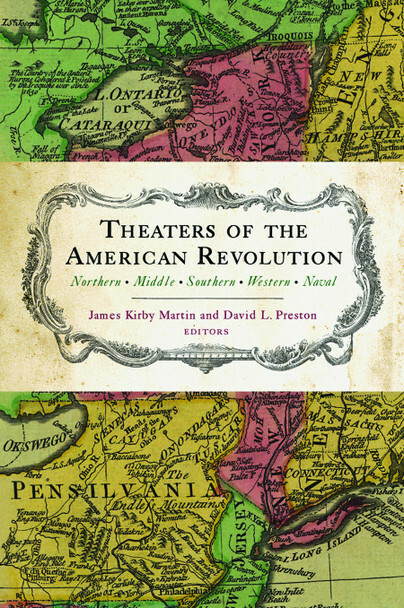 With specially commissioned maps and colorful descriptions of eighteenth century American terrain, settlements, and cities, as well as key battles, Theaters of the American Revolution provides an ideal introduction to understanding one of the most important wars in world history in its totality. JAMES KIRBY MARTIN is the Hugh Roy and Lillie Cranz Cullen University Professor of History at the University of Houston. Among his many books are Benedict Arnold, Revolutionary Hero: An American Warrior Reconsidered; A Respectable Army: The Military Origins of the Republic, 1763–1789, with Mark Edward Lender; and Forgotten Allies: The Oneida Indians and the American Revolution, with Joseph T. Glatthaar. DAVID L. PRESTON is the Westvaco Professor of National Security Studies at The Citadel. He is the author of Braddock’s Defeat: The Battle of the Monongahela and the Road to Revolution and The Texture of Contact: European and Indian Settler Communities on the Frontiers of Iroquoia, 1667-1783.